The kingdom has cut off diplomatic relations with Iran, suggesting it will continue a strategy of pursuing low oil prices to cripple the weak Iranian economy. An escalation, though, could threaten the one-fifth of world oil supplies that travels through the Strait of Hormuz. 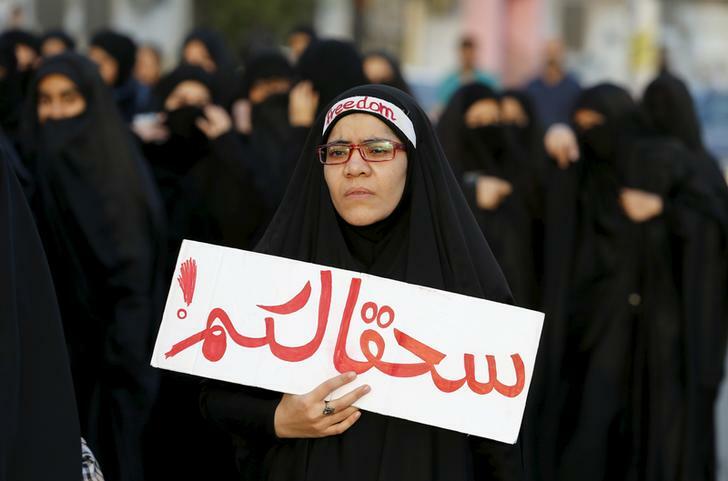 A protester holds a banner saying "to hell with you" as she takes part in a protest against the execution of Saudi Shi'ite cleric Nimr al-Nimr by Saudi authorities, in the village of Sanabis, west of Manama, Bahrain January 2, 2016. Saudi Arabia’s execution of the Shi’ite cleric Nimr al-Nimr has triggered a diplomatic breakdown in relations with Iran. The kingdom cut ties with Tehran after protestors on Jan. 3 stormed the Saudi embassy following the death of Nimr. Riyadh has also ordered Iranian diplomats to leave Saudi Arabia. Worsening relations between the two Gulf powers come as both race to increase oil output. Brent oil has fallen almost 47 percent to around $37 per barrel since April 2015, as Saudi Arabia has continued to dictate OPEC’s strategy of forcing prices lower despite Iranian concerns.